Abstract: There are two issues that influence global interaction, they are environmental and terrorism. Higher education system must try to change students’ perspective about the issues by programming a Green Islamic Campus. The purpose of this program is to make students aware to save environment and apply the Islamic concept universally.The Green Islamic Campus has been launched since 2013 and it has not been evaluated. The research used Context Input Process Product evaluation research model (CIPP). The data were collected by interview, observation, and documentation. Whereas the evaluation criteria used were divided into very less, less, enough, good, very good. The result showed that program including in good category. It can be seen from (1) A very good relevance between objective of the program to the needs of institution development, vision, mission, goal, university strategic plan, and government regulation, (2). A good planning and readiness of resources of that program, that is reflected from a good planning, readiness of students, supported by funding that increased year by year, readiness department, and supported by infrastructure, (3). Good implementation and monitoring(4). A good product of program, that was reflected from academician were quite understand about the program’s running, achievement of saving resources (electricity, paper), plastic waste reduction, ordering of campus area, integration of Islamic concept into learning process, together ritual-praying at campus mosque, 5 minutes ritual speech after Ashar prayer, BaitulArqam and DarulArqam training, and religion reorientation. Implication of research is the program can be forwarded and developed wide to the other universities. Abstract: The objective of this research is to know the effect of organizational culture, self-interest and achievement-motivation towards entrepreneurship behavior of state-universities’ students in Jakarta province and surrounding. Survey was applied in this research which data had been analysed by path analysis after all variables put into a correlational matrix. In this research, three state-universities in Jakarta province and surrounding have been choosen as unit analysis and 150 samples were selected randomly. The result of the research shows that entrepreneurship behavior is effected directly by self-interest and achievement motivation. It is also found that entrepreneurship behavior is effected indirectly by organizational-culture through self-interest and achievement-motivation. Based on those findings it could be concluded that any change or variation which occurred at entrepreneurship behavior might have been effected by self-interest and achievement-motivation (directly) and also it could be effected by organizational-culture (indirectly). Therefore, in entrepreneurship behavior: self-interest, achievement-motivation and organizational-culture should be put into strategic planning of student entrepreneurship program development at the state-universities’ in Jakarta province and surrounding. 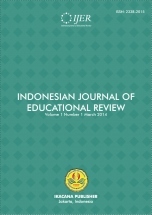 Abstract: This study aims to analyze the implementation of clinical supervision in improving the competence of elementary school teachers in the North bekasi sub-districtand the factors operating as obstacles to the implementation of clinical supervision on primary school teachers in the North Bekasi Sub-District of Bekasi City. The approach used in this study is a quantitative research. The research method survey is simple descriptive analysis. The respondents were teachers and the Principal of Public Primary School. The study was conducted for a period of three months from October to December 2014, The results showed that: 1) Implementation of clinical supervision in enhancing the competence of elementary school teachers in the North bekasi sub-districthas not been implemented properly. 2) The obstacles in the implementation of clinical supervision are as follows: a) Teachers and principals of Public Primary School in North Bekasi does not have a good understanding of the concept and application of clinical supervision yet, b) Teachers and principals does not receive adequate coaching from the school superintendent c) the teacher still have much reluctance and lack of drive in supervision, d) the principal of Public Primary school in North Bekasi has not seriously provided clinical supervision to the teacher. 3) clinical supervision as a way to help teachers improve the competence of teachers. Competence of teachers include: personnel, social, paedagogic, and professional competences. Clinical supervision must come from the initiative of teachers who feel the need to be nurtured, since they have difficulties. The difficulties faced by teachers must be addressed seriously through the development of other parties such as the principal or superintendent of schools. Abstract: This research discusses the compensation costs of mining activities in protected forests in order to seek compensation costs optimal because hilangngnya ecosystem functiont. The survei method was using on applying qualitative approach for the research with The utilization of protected forests for coal mining activities brought the consequences for the sustainability of protected forest ecosystem function that has the main function as a buffer system protection of life. The cost of compensation is required to consider the social aspects, economic and ecological over the utilization of the forest area for mining activities. The results of this study suggested the imposition of compensation costs of coal mining companies over the damage the ecosystem. The use of the cost of compensation, priority is given to the community around the mine and restoration (restoration) ecosystem.Conclude that The cost of negative eksternalitas as compensation costs based on the existence of extracting SDA (coal), the damage of protected forest along with the functions of the environment (project boundaries) and economic losses on Watersheds and coastal (ecological limit), Internalisasi negative eksternalitas costs in the cost of mining production as compensation costs have not been considered the elements of the natural sunberdaya depletion and environmental degradation. Abstract: Technical and Vocational Education programme is meant to train personnel to acquire skills either for self employment or for industrial and national economic development. Despite the importance of technical and vocational Education to the individual and the entire nation, it is being faced with poor enrolment in schools with low standard of performance and withdrawal to another discipline later in life. This is as a result of poor method of admitting students into the programme which exclude consideration for students’ interest (intrinsic motivation) as well as their thinking styles. Whereas, personal interest and innovative or creative thinking styles actually work together to produce creativity. This study therefore was meant to justify the need to include students’ intrinsic motivation (interest) and their thinking styles as part of the measures for admitting students into a qualitative Technical Education Degree programmes. The sample of the study consisted of 45 technical education Degree students of College of Education, Ikere Ekiti in a programme affiliated with University of Nigeria, Nsukka and Ekiti State University, Ado Ekiti Nigeria. The study utilizes both psychometric instrument and in- depth interview to collect data from its subjects. The study was out to determine the quality of the students’ personal interest in the course as well as their their creative thinking style or domain. Why data collected was analyzed using both the qualitative and quantitative methods of analysis. The study found that most students’ creative performance was low, and that most of them were admitted not because of their interest but because it was the last option for them. It was therefore recommended that additional psychometric tests should accompany the aptitude test for admission as this will enhance qualitative Technical Education Degree programme. Abstract: The research was aimed at evaluating the implementation of BIDIKMISI Scholarship for low-economic and good-grade students at the University of Palangka Raya. The evaluation model used for this research was CIPP models. The data was collected using interviews, documentations, observations, and questionnaires. The data was analyzed both qualitatively and quantitatively. The results of the research showed that BIDIKMISI Scholarship at University of Palangka Raya was given based on the laws and regulations, and was implemented comprehensively in appropriate guidelines. The implementation of the program has run positively starting from the socialization and the program was positive in the progress. The result of the program showed positive effect on students’ achievement both in co- and extra-curricular activities. Abstract: This study aimed at obtaining information on the impact of multimodel learning strategies to facilitate the students' learning styles diversity in order to achieve the learning character for Science Subject class VII at Junior High School (SMPN) in Kendari, Southeast Sulawesi. The study uses pre-experimental design One-Shot Case Study on each SMPN category: high, medium, and low. Determining the student type of learning styles based on DePorter et al. (2010), and the achievement of the character is obtained through direct observation, self-assessment, peer-assessment for character aspects: gratitude / spiritual self-assessment, honesty, responsibility, curiosity, creative thinking-innovative, hard work, cooperation and communication, as well as portfolio. Furthermore, the data were analyzed with descriptive and inferential. The research results include; type of learning style by percentage; visual and mixture (multimodality) of 36.24%, 23.58% auditory, and kinesthetic 3.93%. Character achievement score in the students category; 1.31% 96.94% very good; 1.75%) sufficient; and 0% less. There are significant differences between the types of characters achievement of student learning styles in the overall analysis for moderate and low school category, while for high school category did not show a significant difference. Overall, the sequence of characters achievement scores, includes: visual, kinesthetic, auditory, and mix. In medium and low school category, the sequence of character achievement scores is the same, respectively: visual, auditory, kinesthetic, and mix. In addition, there are significant variations in the attainment of character differences between types of student learning styles in each component. This shows the importance of data collection in an integrated character achievement through observation, self-assessment and peer-assessment, as well as portfolios. Abstract: The purpose of the study was to gather information on the participation to physical activity of the Philippine Normal University – North Luzon students. Data were gathered using a survey questionnaire and a follow-up interview to validate the respondent’s information given on the survey. Results revealed that the respondents are a bunch of active people for the past twelve months, who are into walking as part of their physical activity for about 2-4 hours per week. Women favor walking more than the men respondents. It was also found out that they exercise mostly with their friends to improve their health status. For the inactive group, they are not into physical activity because of time constraints, busy doing other things, but given the chance, would like to engage in dance and sports activities. Abstract: The objectof this study wasto determine the effectof organizational structure, leadership behaviors, anddecision making towards organizational commitment DPD board AGPAIIBekasi City. This study uses aquantitative approach with survey method and path analysis techniques. The study population wasallmembers of DPD AGPA II Bekasi city. This study sampled 55 administrators. This research data collection techniques using a questionnaire with five alternative answers (1) always(2) often(3) sometimes, (4) rarely, (5) never. At each study variable. Development ofinstruments for each variable through the conceptual definition, operational definition, grating instrument, testing the validity and reliability calculation. Data analysis techniques with descriptive statistics, inferential. The findings lead to recommendations for improvementof organizational structure will lead to improving organizational commitment, improved behavior ofa leader with some of the leadership style will enhance organizational commitment, decision-making right individuals will increase organizational commitment, improvement of the organizational structure will improve decision making,improvement leader behaviorwill lead to increased retrieval decision. Abstract: This research is a classroom action research which aims at creating teacher's creativity in teaching math concepts through designing mathematics teaching tools. The research was conducted at SMP Negeri 26 Makassar academic year 2015/2016. The school is one of the partner schools of State University of Makassar (UNM), in which the students of State University of Makassar hold their teaching practice (PPL) every year. The subjects of this research were the math teachers and students by expecting to improve the implementation of PPL in the field of mathematics. There were three cycles to implement this classroom action research; planning, implementing, observing, and reflecting. The data were obtained through observation and tests and analyzed by the descriptive analysis of narrative. The results obtained are: 1) the teachers are motivated in making mathematics teaching tools, 2) there is an improvement in the learning process as the teachers optimize the use of mathematics teaching tools, 3) generally, the students agree that learning by using mathematics teaching tools is better than learning without any, 4) by using mathematics teaching tools, almost all the subjects can reduce the level of abstraction of its math subject matter, and 5) the teachers can develop students’ thinking ability.